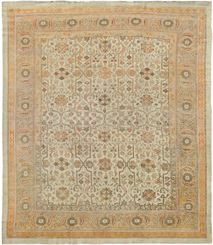 Located in west-central Anatolia (Turkey), Oushak's weaving centers date back to the 15th century. 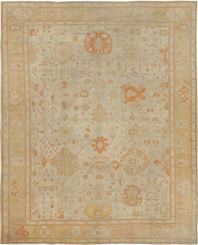 The 16th and 17th centuries are revered as the Classical period for these rugs, where the true beauty of this art form was realised. 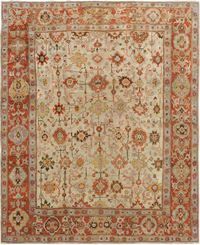 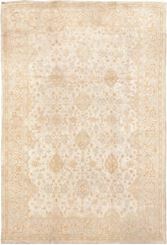 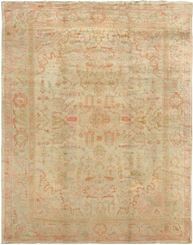 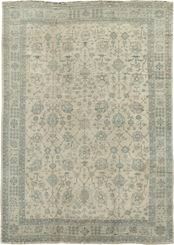 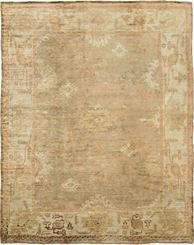 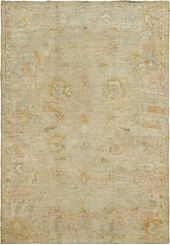 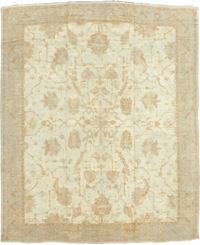 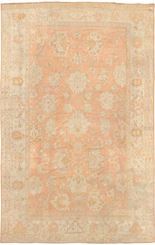 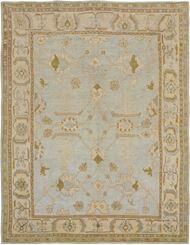 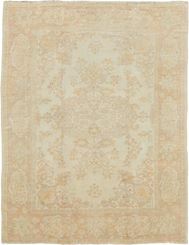 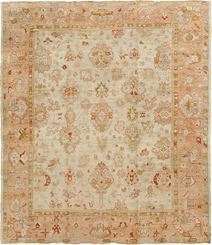 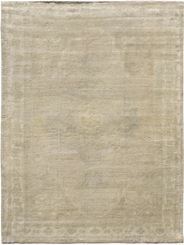 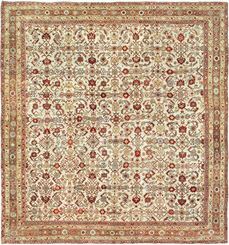 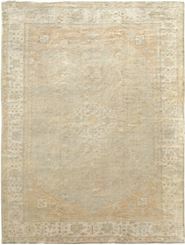 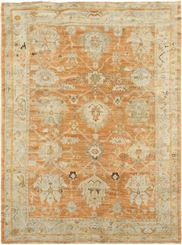 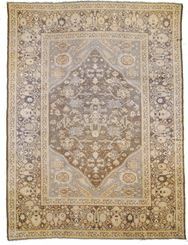 Manufacturing skill paired with masterful designs made Oushak rugs and carpets very popular with strong demand. 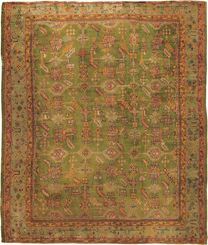 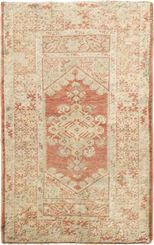 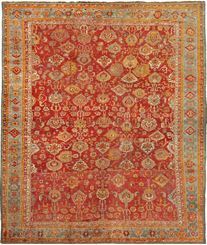 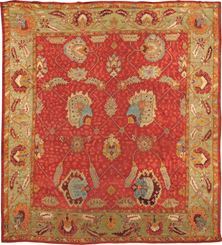 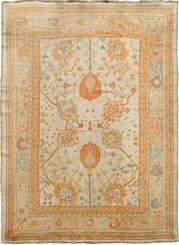 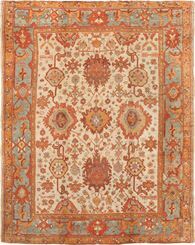 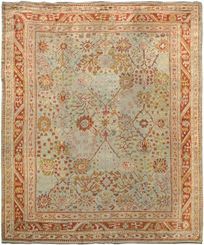 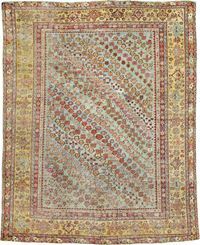 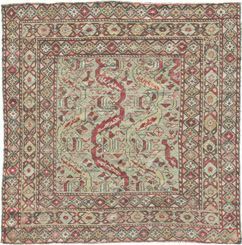 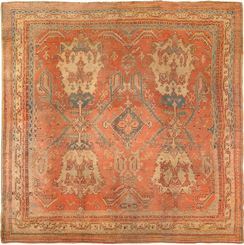 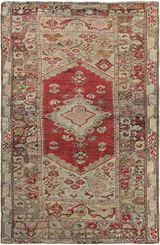 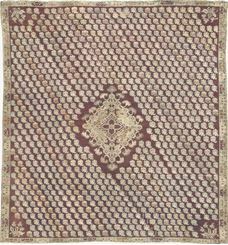 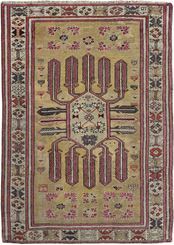 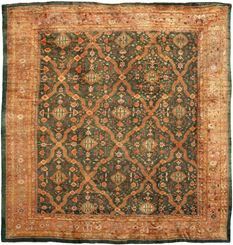 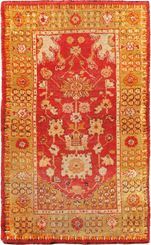 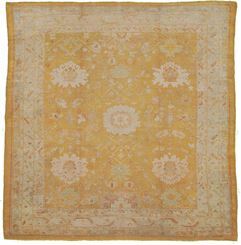 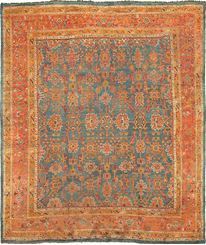 The rug renaissance of the 19th century, played an important role in Turkey and Oushak once again became one of the principal weaving centers. 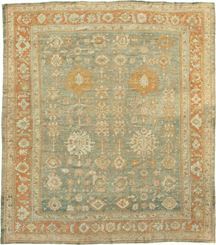 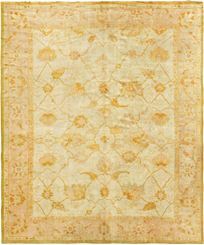 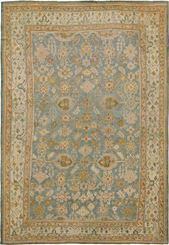 Western influence helped to initiate an abstract view point to the classical intricate designs of the past. 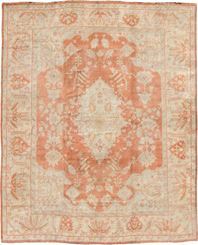 By coarsening the weaves and increasing the scale of designs, a casual interpretation was formed. 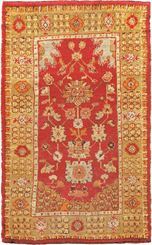 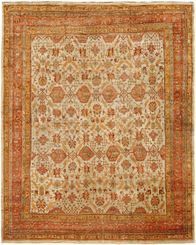 Oushak carpets are among the most sought after in the decorative world and have been made in sizes ranging from small to mansion. 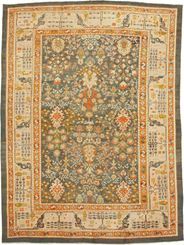 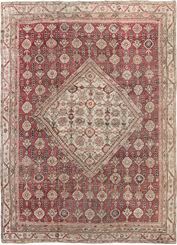 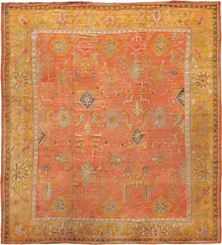 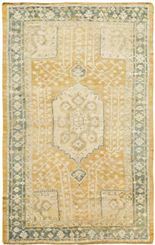 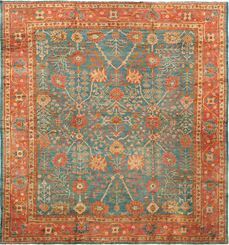 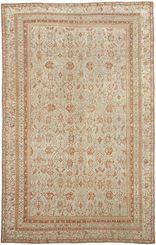 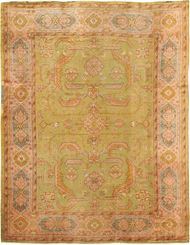 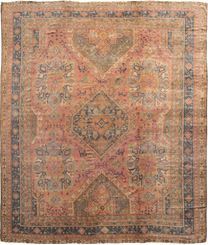 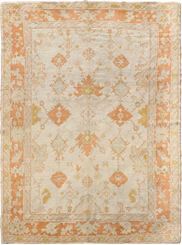 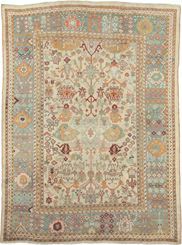 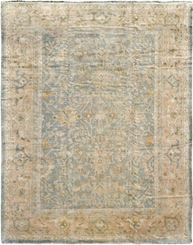 ANTIQUE OUSHAK 17' 6" x 18' 4"
ANTIQUE GHIORDES 17' 3" x 27' 0"
ANTIQUE OUSHAK 17' 0" x 20' 0"
ANTIQUE OUSHAK 16' 7" x 19' 9"
ANTIQUE OUSHAK 16' 0" x 19' 8"
ANTIQUE OUSHAK 15' 7" x 16' 7"
ANTIQUE OUSHAK 15' 3" x 17' 7"
ANTIQUE OUSHAK 15' 0" x 16' 2"
ANTIQUE OUSHAK 14' 7" x 17' 4"
ANTIQUE OUSHAK 14' 6" x 22' 0"
ANTIQUE OUSHAK 14' 5" x 15' 0"
ANTIQUE OUSHAK 14' 0" x 19' 3"
ANTIQUE GHIORDES 14' 0" x 15' 5"
ANTIQUE OUSHAK 13' 9" x 16' 6"
ANTIQUE OUSHAK 13' 7" x 18' 6"
ANTIQUE OUSHAK 13' 7" x 16' 2"
ANTIQUE OUSHAK 13'4" X 19'0"
ANTIQUE OUSHAK 13' 2" x 16' 2"
ANTIQUE OUSHAK 13' 0" x 18' 8"
ANTIQUE OUSHAK 13' 0" x 16' 2"
ANTIQUE GHIORDES 13' 0" x 18' 8"
ANTIQUE OUSHAK 12' 9" x 20' 3"
ANTIQUE OUSHAK 12' 7" x 16' 4"
ANTIQUE OUSHAK 12' 0" x 16' 7"
ANTIQUE OUSHAK 10' 8" x 13' 4"
ANTIQUE OUSHAK 10' 3" x 14' 2"
ANTIQUE OUSHAK 10' 0" x 12' 1"
ANTIQUE OUSHAK 10' 0" x 12' 6"
ANTIQUE OUSHAK 10' 0" x 13' 0"
ANTIQUE OUSHAK 9' 9" x 13' 7"
OLD OUSHAK 9' 9" x 11' 6"
ANTIQUE OUSHAK 9' 8" x 13' 1"
ANTIQUE ANGORA OUSHAK 9' 6" x 12' 0"
ANTIQUE GHIORDES 9' 5" x 9' 10"
ANTIQUE OUSHAK 9' 4" x 12' 7"
ANTIQUE GHIORDES 9' 2" x 12' 1"
ANTIQUE OUSHAK 9' 1" x 12' 0"
ANTIQUE OUSHAK 9' 1" x 11' 6"
ANTIQUE OUSHAK 9' 1" x 11' 7"
ANTIQUE OUSHAK 9' 0" x 12' 0"
ANTIQUE OUSHAK 9'0" X 15'10"
ANTIQUE OUSHAK 9'0" x 11'4"
ANTIQUE OUSHAK 9' 0" x 11' 4"
ANTIQUE ANGORA OUSHAK 9' 0" x 10' 6"
ANTIQUE OUSHAK 8' 6" x 11' 3"
ANTIQUE OUSHAK 8' 2" x 14' 7"
ANTIQUE GHIORDES 8' 0" x 9' 8"
ANTIQUE OUSHAK 8'0" x 12'7"
ANTIQUE OUSHAK 7' 9" x 10' 6"
ANTIQUE OUSHAK 7' 9" x 8' 7"
ANTIQUE OUSHAK 7' 7" x 11' 4"
ANTIQUE OUSHAK 7' 2" x 13' 2"
ANTIQUE OUSHAK 7' 2" x 9' 7"
ANTIQUE OUSHAK 7' 0" x 9' 5"
ANTIQUE OUSHAK 6' 9" x 9' 7"
ANTIQUE OUSHAK 6' 9" x 9' 0"
ANTIQUE ANATOLIAN 6' 8" x 11' 10"
ANTIQUE OUSHAK 6' 7" x 7' 2"
OLD TURKISH 6' 6" x 11' 2"
OLD TURKISH 6' 6" x 11' 7"
ANTIQUE ANGORA OUSHAK 6' 3" x 6' 5"
ANTIQUE ANGORA OUSHAK 6' 1" x 7' 9"
OLD TURKISH 6' 0" x 8' 10"
ANTIQUE OUSHAK 6' 0" x 9' 1"
ANTIQUE OUSHAK 5' 10" x 12' 9"
ANTIQUE GHIORDES 5' 9" x 5' 9"
ANTIQUE ANGORA OUSHAK 5' 6" x 8' 3"
ANTIQUE ANGORA OUSHAK 5' 1" x 6' 9"
ANTIQUE OUSHAK 5' 1" x 11' 0"
ANTIQUE OUSHAK 5' 0" x 5' 0"
ANTIQUE GHIORDES 4' 9" x 10' 5"
ANTIQUE OUSHAK 4' 9" x 16' 10"
OLD TURKISH 4' 8" x 6' 4"
ANTIQUE GHIORDES 4' 7" x 8' 1"
ANTIQUE GHIORDES 4' 6" x 9' 9"
ANTIQUE GHIORDES 4' 6" x 12' 10"
ANTIQUE GHIORDES 4' 5" x 7' 0"
ANTIQUE OUSHAK 4' 4" x 8' 6"
ANTIQUE TURKISH 4' 3" x 13' 4"
ANTIQUE TURKISH 4' 1" x 10' 0"
ANTIQUE OUSHAK 3' 9" x 7' 7"
ANTIQUE OUSHAK 3' 7" x 11' 9"
ANTIQUE OUSHAK 3' 7" x 6' 5"
ANTIQUE OUSHAK 3' 6" x 5' 10"
ANTIQUE OUSHAK 3' 6" x 6' 3"
ANTIQUE GHIORDES 3' 6" x 5' 6"
ANTIQUE GHIORDES 3' 6" x 5' 0"
ANTIQUE OUSHAK 3' 4" x 5' 8"
ANTIQUE GHIORDES 3' 4" x 5' 5"
ANTIQUE TURKISH 3' 4" x 12' 8"
ANTIQUE GHIORDES 3' 2" x 12' 4"
ANTIQUE OUSHAK 3' 1" x 6' 5"
ANTIQUE OUSHAK 3' 0" x 18' 0"
OLD TURKISH 3'0" x 10'7"
ANTIQUE OUSHAK 3' 0" x 12' 3"
ANTIQUE OUSHAK 3' 0" x 11' 10"
ANTIQUE OUSHAK 2' 10" x 5' 4"
ANTIQUE OUSHAK 2' 10" x 17' 2"
ANTIQUE OUSHAK 2' 10" x 5' 5"
ANTIQUE OUSHAK 2' 9" x 10' 2"
OLD OUSHAK 2' 8" x 11' 2"
ANTIQUE OUSHAK 2' 1" x 3' 10"